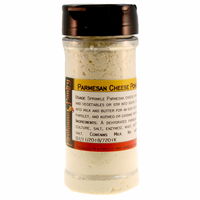 Product Details: Sprinkle our dehydrated Parmesan cheese powder onto pasta dishes, popcorn, and steamed vegetables or stir into soups, casseroles, dips and spreads. Follow the recipe below for a quick and easy Alfredo Sauce. 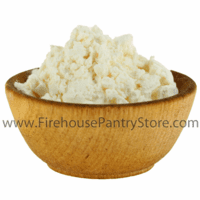 No refrigeration required! Stores and travels well; great for emergency food supplies. Ingredients: dehydrated parmesan cheese (part-skim milk, cheese culture, salt, enzymes), whey, buttermilk solids, sodium phosphate, salt. Contains milk. Packaged in a facility that also handles wheat, milk, soy, egg, sesame, peanuts, and tree nuts. 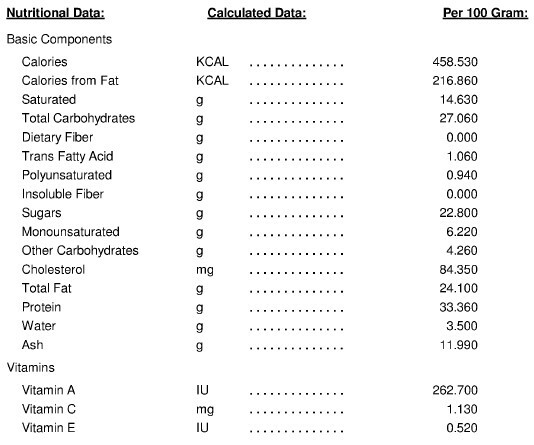 Nutrition Facts: Click here for data per 100 grams (not per serving).